The purpose of programming a crystal or gemstone is to focus its abilities on something you specifically need, thereby magnifying the stone's intent through your own. The purpose of dedicating the stone to a high-level healing energy or Goddess (God) is to protect it from negative energy. A crystal or stone that is programmed and dedicated in these ways becomes much more powerful and useful as a tool. This is a very simple process. You just obtained a new crystal and now you would like to start utilizing its energy and gifts. However, before dedicating or programming your crystal, the first thing you should to do is to clear it of negative or harmful energy. Hold the crystal or gemstone in your hand and sense its energy. With the stone being newly cleared, the energy will feel stronger and even more appealing than before. As you sense this energy and appreciate it, ask quietly to be connected to the deva of the crystal or gemstone. Though not animate, stones are living things and the deva of the piece is the stone's life-force energy. Once you feel you have sensed what you can from the energy, think of what you will be using the stone for. Think of these uses, then quietly ask the gemstone if it is willing to act in the way you wish. The crystals energy may increase with a yes or seem to disappear with a no. If the stone accepts your intent, state in your mind that it be so. Once a stone is programmed, it will hold its intent until you or someone else reprograms it. To prevent any negative energy from attaching itself to your crystal you may wish to dedicate it. 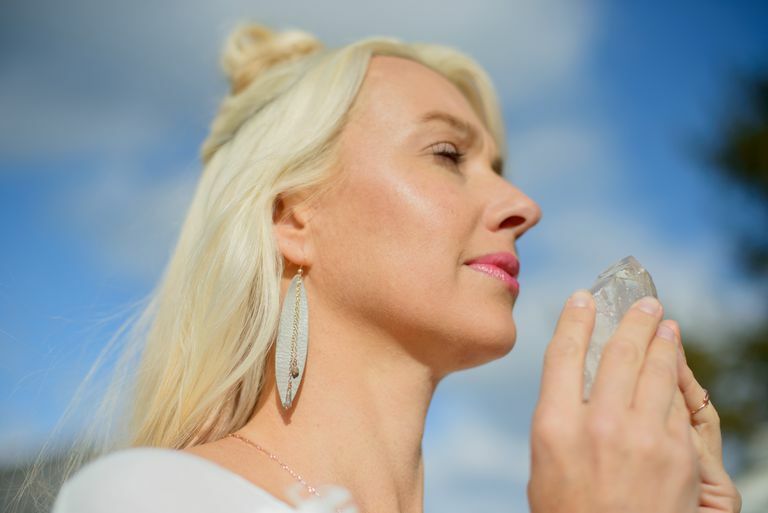 Hold the crystal or gemstone in your hand and state clearly in your mind: "Only the most positive high-level energy may work through this healing tool." Focus on your intent for awhile, then end your sensing (meditation) with "SO BE IT." The stone is now dedicated. Kellie Jo Conn is the owner of Avalon Crystals. She received her gemology degree in 1989 from the Gemological Institute of America and attained Usui Reiki Mastery in 1995.